Naturopath Nabita Ananda grew up in Kathmandu city, Nepal. Her inspiration to spirituality was PAIN and it became one of the reasons to travel India. Pain motivated her to disagree and deny the mundane life and persuaded her to search a meaningful and different life. In pursuit of spirituality Nabita extensively travelled in India. The cause of pain was her slip disc problem she suffered and almost arranged a spinal surgery when she was only 20 years old. Pain resulted depression and depression increased pain. Trapped in this vicious circle she too, lost her hope. But as they say, winter does not last forever. Thus, days of hope and sunshine was regained in her life when she met Manokranti GURU, DR. Yogi Vikashananda, a Naturopath, Reiki master and Yoga Teacher in Nepal. 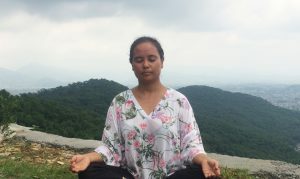 Twenty one Reiki sessions, couple of Yoga asana, healthy eating habit and practice of meditation empowered her to overcome all her physical and mental obstacles to vitality. She was healed 100%. She walked, cycled, laughed and jumped freely, even better than ever before in her life. Astounding experience of transformation via simple, but undeniable, powerful healing techniques, left her inquisitive. This resulted paradigm shift in her belief and perception on pain and pleasure of life. She taught Manokranti Yoga and Manokranti Reiki for more than 12 years in India, Nepal and Australia. Coming so far, exploring and experimenting, she has gained profound experience and knowledge on Reiki, yoga, naturopathy and spiritualty in these 20 years. She is very grateful to all the pain and pleasures of life she had in her past, for it all made her what she is today. Today she has become the colour white (Shweath!, as in Sanskrit), the colour which is actually made up of different colours yet radiates as white. Yogi Raj is an introvert person with full of calmness within. He did not know his passion for food preparation and cooking until he found that he could cook and cook really delicious food when he was in Goa ! 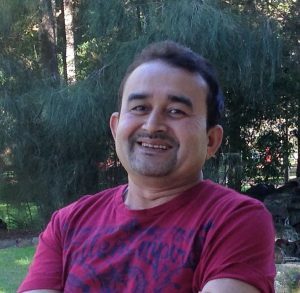 Raj ran his own restaurants at various tourist destinations of India like Goa, Dharamshala, Laddak and Rishikesh for more than a decade. He always had passion for health food and believed in natural, organic food eating habit. Like he says, “In my childhood days there were no such packaged snacks that we find today. When I wanted to snack I would reach my garden for, baby cucumbers, carrots or beetroots, pluck them and eat!’ Raj grew in his farm in Nepal with his family and misses traditional and medicinal foods. He ran the famous Oasis restaurant in Rishikesh and succeeded in naming it in the Lonely Planet. After an accident and severe leg injury Raj’s focus turned towards spiritual healing and practice. In the year 2012 he attuned himself in Reiki and introduced yoga practice in his life. Though he gave up his restaurant business in India his passion for health food was still alive. Thus in partnership with his wife Naturopath Nabitananda, he is making an entry again in the food world. He is all set with his passion, mission and profession of health food ,’The Yogic Kitchen’, at Yoga Chautara!